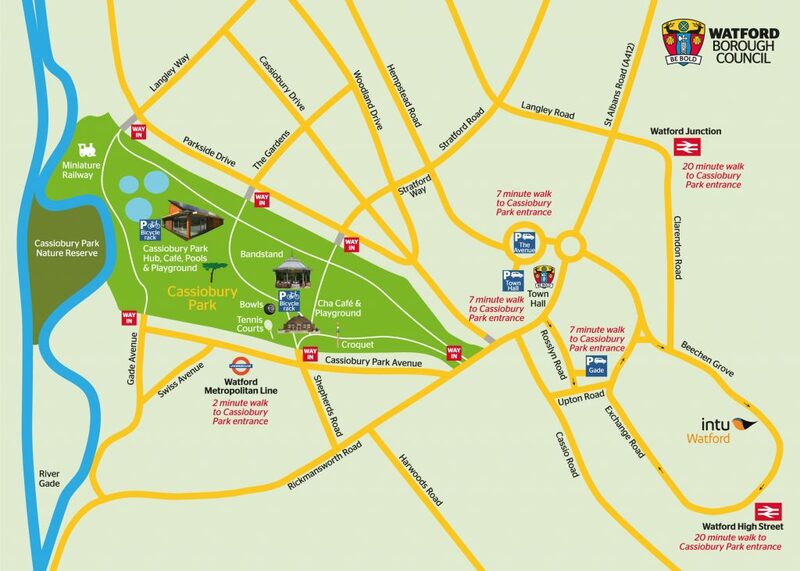 We are located at the heart of Watford’s Cassiobury Park – easily reached by car or public transport. There is an 88 space free car park at the end of Gade Avenue – postcode WD18 7LG (please note we anticipate the car park will be closed in early 2019 for rebuilding). Some limited parking is available on streets around the park. Alternatively the ‘Town Hall’ and ‘Gade’ Pay & Display car parks are a short walk from the top of the park. Cassiobury Park is a 2 minute walk from Watford Station on the Metropolitan Line. Watford Junction (1.3 miles) and Watford High Street (2.1 miles) are the two closest overground stations. The 352 service stop outside Watford Metropolitan line station which is a two minute walk from the park. Alternatively many more services stop in Watford town centre.